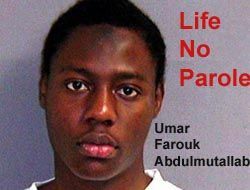 As expected, a federal judge in Detroit today sentenced Umar Farouk Abdulmutallab, aka the Underwear Bomber and Captain Underpants, to life in prison for his failed attempt to blow up a Northwest Airlines flight en route to Detroit on Christmas Day in 2009. Since the federal system has no parole, a life sentence means exactly that. “The defendant has never expressed doubt or regret or remorse about his mission... “To the contrary, he sees that mission as divinely inspired and a continuing mission.” [Judge Nancy Edmonds] said she can't control his motives, but she can control his opportunity. She ordered the life sentences to be served consecutively. As he was led out of the courtroom, he said, "G-d is Great." The Government filed its sentencing statement today in the case of Detroit Underwear Bomber Umar Farouk Abdulmutallab. 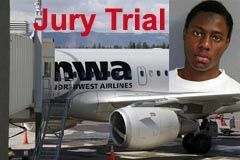 The Government delivered its opening statement in the terror trial of Umar Farouk Abdulmutallab, the so-called "underwear bomber" charged with trying to blow up a NW Airlines plane en route to Detroit. Reporters are tweeting live from the court. Check out the Guardian's Paul Harris @paulxharris, Robert Snell of the Detroit News @Detroitfedcourt and Steve Futterman of CBS @sfutterman. The jury has been selected in the trial of Umar Farouk Abdulmutallab. There was an interesting twist, as after the jury was picked, the Judge dismissed juror #321, a woman from Nigeria. The judge didn't explain why she dismissed the juror, who is president of a Nigerian cultural association in Metro Detroit. During jury selection Wednesday, the woman said she has lived in the United States since 1994 and has relatives in Nigeria. She did not know Abdulmutallab's family. The Nigerian woman also said if she rendered a guilty verdict, it would not create a problem back home but she did not want her identity revealed. The trial of accused "underwear bomber" Umar Farouk Abdulmutallab will begin in October. Next week, potential jurors will begin filling out questionnaires. Abdulmutallab is representing himself, with the assistance of standby counsel Anthony Chambers. Umar Farouk Abdulmutallab, aka the Underwear Bomber, will go to trial on October 4. The federal judge presiding over his case today refused to set a later date. Judge Nancy Edmunds tried to talk the 24 year old out of representing himself -- he fired his public defenders months ago -- to no avail. He does have a standby counsel. As Abdulmutallab repeatedly affirmed that he wished to continue as his own lawyer, the judge reminded him that -- even if he accepted representation -- he could always come to her directly with any concerns or questions. "I understand you may worry about losing control over what happens to you," she said. "I can understand that is a frightening prospect and I am here to listen." Abdulmutallab faces life in prison if convicted. His stand-by counsel says it's a very defensible case. Apparently, the Public Defender's office has expert reports that the device in his underwear could not have blown up the airplane. Really bad move by Umar Farouk Abdulmutallab, the Detroit underpants bomber. He fired his public defenders today and told the court he will represent himself. The Court will appoint stand-by counsel. Is he taking a page from the Zacarias Moussaoui playbook? If so, he should know it didn't work out too well for Moussaoui, who is serving life in prison. The Government of Nigeria this week filed this unusual pleading seeking to enter an appearance in the criminal case of Umar Farouk Abdulmutallab , the alleged "underpants bomber" and asked that it be provided copies of all filings and allowed to be present at hearings and trial. To ensure that the Defendant who is a citizen of Nigeria is accorded a fair trial, due process of law , effective assistance of counsel and that his trial is in accordance with acceptable international standards without compromising the official position of the government of Nigeria on the nature of crime committed by the defendant which is a total denunciation of the alleged acts committed by the Defendant. The request was denied. The next status conference is September 13. No trial date has been set. Sounds to me like this was a public relations move since they can get the non-sealed pleadings off of PACER and court hearings are open to the public. But I hope someone in the Netherlands or Aruba picks up on it and files a similar request for Joran in Peru. Has the U.S. Targeted Cleric al-Awlaki for Assassination? First we had the congressional hearing at which Director of National Intelligence Dennis Blair gave details of information Umar Farouk Abdulmutallab (aka Private Underpants) has given to the FBI during debriefing sessions. He also explained that it's acceptable policy for the U.S. to target Americans overseas for assassination. I'm demoting Captain Underpants, Umar Farouk Abdulmutallab, to Private Underpants. He's a nobody, a kid following the pied piper, and the over-reaction to him by our elected officials, is becoming embarrassing. Republicans are using him, just as they are using the issue of the 9/11 trials, to steal the spotlight and rally their troops to get them votes in 2010. How do they even keep a straight face while they are spouting their nonsense? This should be no surprise. Umar Farouk Abdulmutallab is continuing to cooperate and provide information on the failed Christmas Day airline bomb plot. His lawyer is facilitating the negotiations. This is what often happens in criminal cases when a probable life sentence is on the table. Or, in the case of accused Mumbai co-conspirator David Coleman Headley, a death sentence. All those Miranda fears are for naught. Criminal defendants get lawyers. Lawyers review the evidence. If the case is strong and the evidence likely to be ruled admissible, they consider plea bargains that involve cooperation. It happens daily in courtrooms across America. Terror cases are no different. What throws a wrench into the works is when law enforecment officers fail to abide by the rules and violate a suspect's rights. Then evidence can be thrown out and there's less incentive to make a deal. If they just followed the rules, it would be so much better for everyone. Osama bin Laden released a videotape yesterday claiming credit for AQAP and Umar Farouk Abdulmutallab's failed bomb plot on the Delta flight to Detroit on Christmas Day. In a short recording carried by the Al-Jazeera Arabic news channel, bin Laden addressed President Barack Obama saying the attack was a message like that of Sept. 11 and more attacks against the U.S. would be forthcoming. "The message delivered to you through the plane of the heroic warrior Umar Farouk Abdulmutallab was a confirmation of the previous messages sent by the heroes of the Sept. 11," he said. "America will never dream of security unless we will have it in reality in Palestine," he added. "God willing, our raids on you will continue as long as your support to the Israelis will continue." Umar Farouk Abdulmutallab appeared in federal court in Detroit today. A guilty plea was entered on his behalf. His head was shaved, which according to observers, made him look even younger than his 23 years. He is represented by the Federal Defender's office. His parents have hired U.S. lawyers from Nigeria to observe the proceedings and keep them informed, but Federal Defender Miriam Siefer (an excellent attorney) told the court their office expects to continue to represent Umar. Umar faces a possible life sentence on the first count in the Indictment, attempted use of a weapon of mass destruction.